Apparently, Zach Britton has decided life in the Yankee bullpen is worth living for the next few years, and the Yankees have decided concurrently that life in their bullpen can only be enhanced by keeping him aboard. Hence will Britton sign to return to the Bronx for three years, $40 million, and an opt-out clause contingent on whether the Yankees pick up a fourth-year option after the second year of the new deal. The Angels were thought to be the top finalists for both Britton and David Robertson, before Robertson negotiated his own new deal with the Phillies, eliminating the middle man, for two years, $23 million. Needing a serious bullpen upgrade, the Angels apparently didn’t move fast or furious enough on either, which seems a little too par for their course. The Phillies have more or less hinted Robertson stands to become their Andrew Miller, going into games when they’re on the line regardless of the inning in question as well as being one of two relievers (Seranthony Dominguez the other) in line for the save opportunities. Britton merely re-joins a very powerful Yankee pen with encouraging work to build on since he went there from the broiled and basted Orioles last summer. 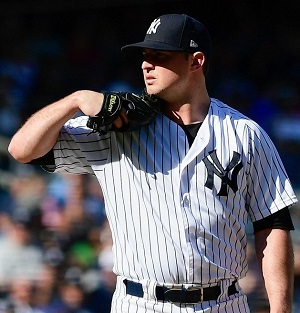 The Empire Emeritus didn’t exactly want to lose Robertson if they could help it, but they’re banking on Britton building upon 25 Yankee innings with a 2.88 ERA including 21 strikeouts. If he’s really begun to re-discover the right handle on what was once his money pitch, a hard, sharp, wipeout sinkerball, the Yankees make out at bargain rates when all is said and done. The alarms sounded softly in Britton’s deeper numbers: his fielding-independent pitching rate (FIP: your ERA when your defense is taken out of the equation, folks) as a Yankee was 4.08, but that was down from the 4.44 FIP he showed with the Orioles last year before the trade. His strikeout-to-walk rate was 1.91 as a Yankee and 1.62 on the season as a whole. The Yankees know he isn’t quite Zach the Knife who terrorised the American League from 2014-2016. They also know he may not become that Britton ever again. But if he can build on what he did do for them last year, they’ll get a Britton who keeps their bullpen in one piece and makes life a lot simpler in the late innings. For the Yankees, that is. A pen with such bulls as Aroldis Chapman, Dellin Betances, Chad Green, and a healthy Britton can turn the rest of the American League into a china shop. If the Yankees want to go back to the postseason and go deeper than the round one dispatch they got from the Red Sox last October, they’ll need that. And maybe this time Britton’s manager won’t leave him or any of the other bulls stewed and warmed in the bullpen with no place to go when a wild card game, if not a pennant, is on the line. Two Octobers ago, the Orioles and the Blue Jays took the wild card game to the eleventh inning tied at two each. The Jays spent their then-closer Roberto Osuna for a wipeout ninth against two of the Orioles’ biggest boppers, Manny Machado and Mark Trumbo, plus Matt Wieters, and the teams matched bulls until Orioles manager Buck Showalter pulled Brian Duensing after he opened the bottom of the eleventh by striking out Ezequiel Carerra. Showalter reached for Ubaldo Jimenez, normally a starter but on a string in which he surrendered only a .172 batting average against him from August beginning through regular season’s end, married to a .252 on-base percentage. But Jimenez surrendered back-to-back singles for first and third, on fastballs down the pipe or at least belt high, abetted by left fielder Nolan Reimhold’s bobble of Josh Donaldson’s first-pitch base hit. And the skipper plus his infielders confabbed at the mound. Maybe they agreed Jimenez’s job regarding Edwin Encarnacion checking in at the plate was to throw nothing but a double play ball. What just about everyone in baseball agreed upon in that moment was how ridiculous it seemed that Britton—who’d just posted the arguable best season any major league closer’s had under the contemporary coordinates of the job—wasn’t even a topic. He’d allowed four earned runs all year long and not a one since April, he had an 0.54 ERA and a 1.94 FIP, and out of 254 hitters faced 202 of them either struck out or whacked balls into the ground. Yet Showalter didn’t go to the mound with a hook for Jimenez and a signal for Britton. He didn’t even have Britton warming up. Showalter’s was the wrong conservatism in that moment, wanting the righthander-vs.-righthander matchup, not even pondering that, lefthander though he is, Britton in 2016 kept righthanded hitters to a .155 batting average and a .199 slugging percentage. With Encarnacion hitting in the lap of luxury as it was, having to think of nothing more complicated than hitting a measly sacrifice fly to win it, that luxury would have been spoiled if he’d had to try getting Britton’s sinker in the air. But you know about those looking gift horses in the mouths. The Orioles should have. Their lineup struggled against lefthanded pitching that year but the Jays started righthander Marcus Stroman against them that night. And the only thing the Orioles had to show for it was Trumbo’s two-run homer in the fourth. So it was Jimenez versus Encarnacion, leaving Encarnacion in the luxury bath. Sure enough, Jimenez threw Encarnacion a fastball right down the pipe to open. And Encarnacion hit that gift into the second deck, turning Rogers Centre into the place where the nuts hunt the squirrels, sending the Jays to the division series they’d win against the Rangers only to lose the League Championship Series to the Indians. Showalter hadn’t learned a thing from Mike Matheny’s identical mistake two years prior. With a trip to the 2014 World Series on the line, Matheny stayed with a still-rusty Michael Wacha in the bottom of the ninth rather than reach for his then-shutdown closer, Trevor Rosenthal, because, well, you don’t bring your closer in unless you have a lead to protect, right? Wrong. The then-Cardinals manager watched Travis Ishikawa channel his inner Bobby Thomson and hit a three-run homer to the top of Levi’s Landing in Pac Bell Park with the pennant attached. Inspiring dubbings of Russ Hodges over Joe Buck and sending the Giants to the World Series. Showalter and Matheny can commiserate over a few drinks now. Matheny and two coaches were purged last July, the first in-season managerial change the Cardinals made in almost a quarter of a century. Showalter was executed a couple of days after the 2018 season ended. Matheny lost his clubhouse; Showalter—who’d turned the Orioles around after taking over in 2010 and taking them to a three postseasons in five years string, belying his former reputation as a detail freak who wore out his welcome as fast as he earned it—may have been lucky not to lose his marble. Singular. The Orioles collapsed completely after that wild card game loss. They finished dead last in the American League East the next two seasons including 2018 and found themselves forced to offload their more prime talents including Machado and Britton. Britton himself suffered even worse, losing part of early 2017 to tightness in his forearm, before an offseason workout hit him with a torn Achilles tendon that would keep him out of action until June last year. Dealing Britton and Machado (to the Dodgers) was the Orioles’ admitting that it was time to blow up and rebuild. After they’d been 7-20 at one point last year, thirty years after another Orioles team with a couple of future Hall of Famers (Cal Ripken, Eddie Murray) aboard opened a season 0-21. The Yankees have re-upped Britton and may yet remain in the Machado market. All Yankee manager Aaron Boone has to do is prove he’s learned a lesson or two from last fall’s division series wipeout, and not leave Britton or any of his best bulls blowing in the wind, while leaving lesser or gassed arms to do the clutch pitching with a postseason advance on the line.